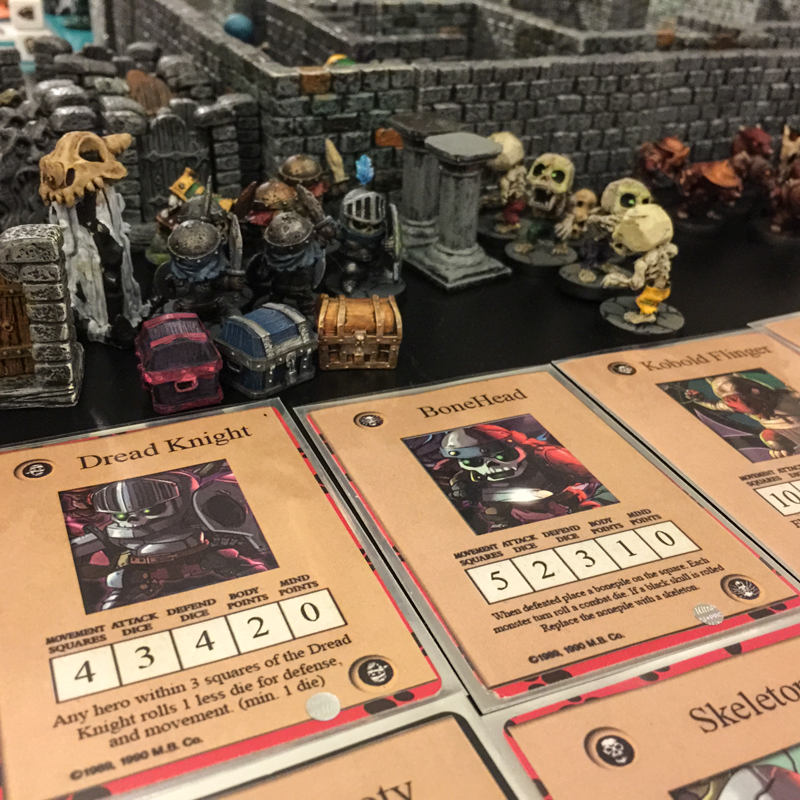 HeroQuest has no level up system, you get and keep better loot as you go. This works and by the end you are pretty !SODA! 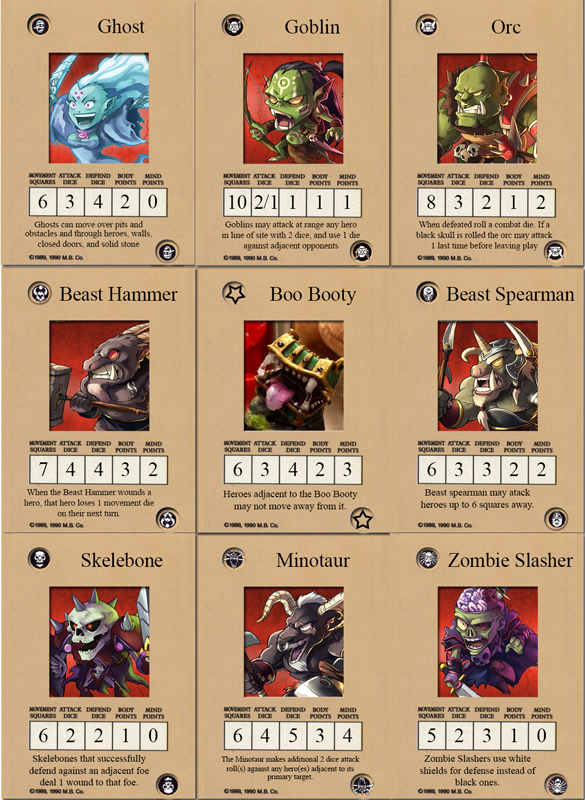 tough, but leveling up is fun and also allows you to add tougher mobs and boss monsters. Basically every time a hero survives 3 quests they unlock a new ability. I stuck with the 4 main heroes, despite the many cool SDE options, because it would have been a lot of work. If anyone else has suggestions for any I’d love to see them. 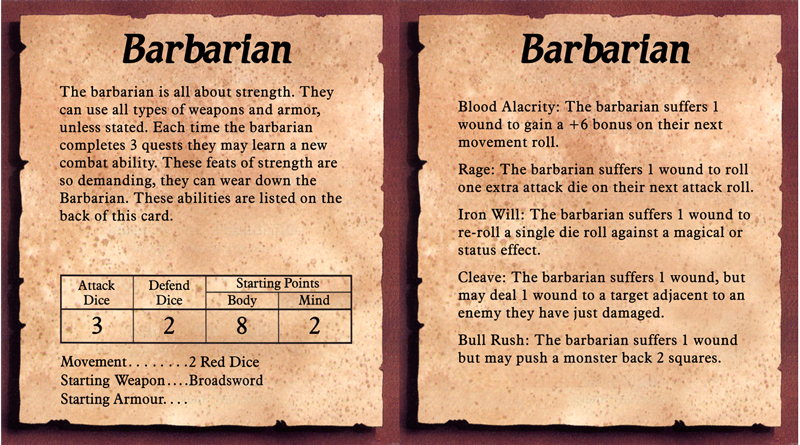 Started with the 8 basic HeroQuest mobs and tried to pair them off with SDE/AQ equivalents. Every mob has a special ability to make them more interesting. 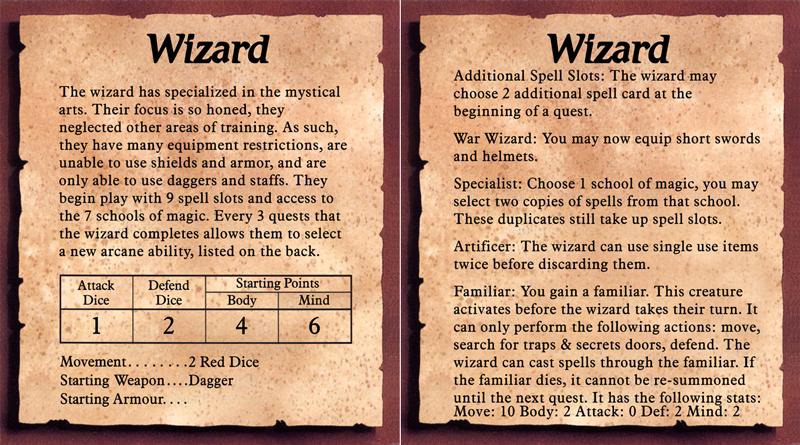 In some cases I went with some 4e D&D stuff as shifty kobolds are a lot less lethal than mob kobolds. Because BooBooties are the best, they replace all(most) trapped chests in the game. A BooBooty chest can be detected by searching for traps. BooBooties cannot be disarmed, but only attack if: attacked or if a hero moves adjacent to them. Treat as a wandering monsters when triggered. Last edited by CrashGem on March 23rd, 2015, 4:03 pm, edited 1 time in total. Turning to face you, she catches the four of you stuffing all the cookies and refreshments into your hungry mouths. Everyone in the room stops. The only sound is crumbs dribbling from your mouths to hit the tabletop. An exasperated sweatdrop appears over her forehead. 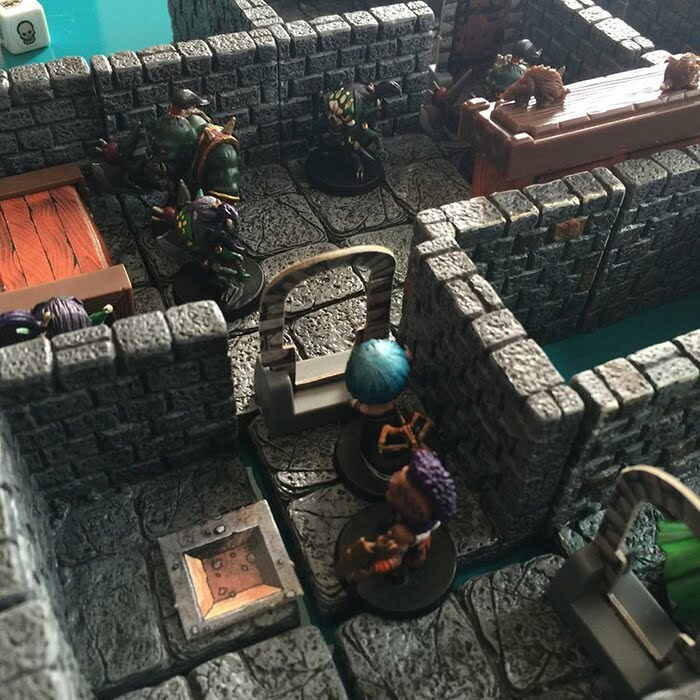 Collecting herself, she continues, “A band of kobolds led by the kobold ogre Rager Rex have taken up residence in an ancient burial ground, Felmarg’s Tomb. Be warned they have likely disturbed the residents of the tomb with their antics, so you will find yourself facing foes both living and undead. See that Rager Rex is defeated and report back to me anything unusual. Accomplish this task, and you will be ready for the title and responsibilities of Heroes. ♥ Replace Verag the gargoyle with Rager Rex the Kobold Ogre (Fimir) and increase his body points to 3. This went really well and was a lot of fun. Quest 1 is traditionally a bit of a meat grinder, with all mobs represented and no decent equipment. Adding in the monsters new special abilities really pushed the limits here, but still made things much more interesting. 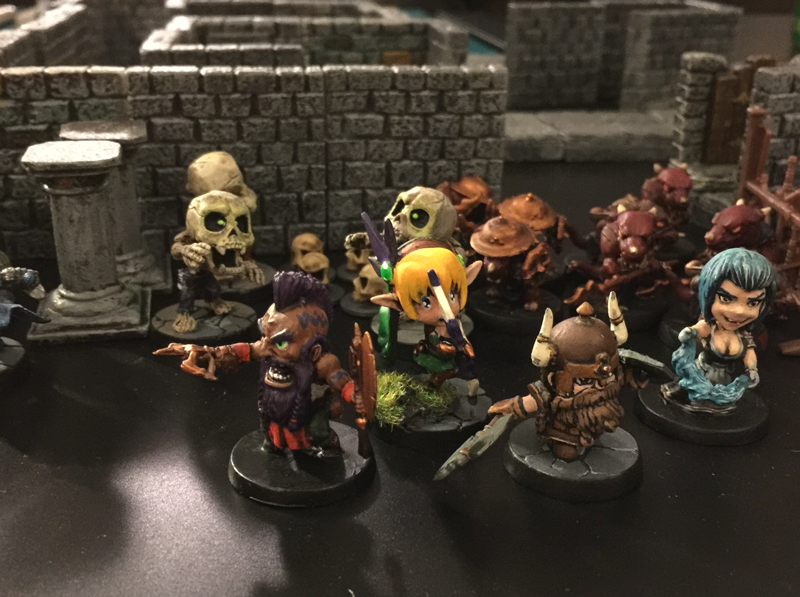 The heroes wound up taking the "undead" route and encountered Felmarg and friends. 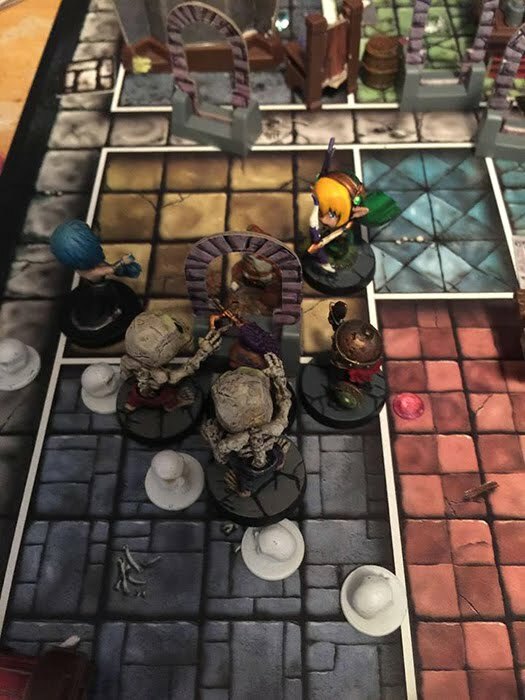 The dread knight's aura was very tough and the heroes really only prevailed with the aid of magic (those elf spells are nuts). In the final "boss battle" the wizard 1-shotted the boss with Genie, but we then flattened by the remaining mobs. 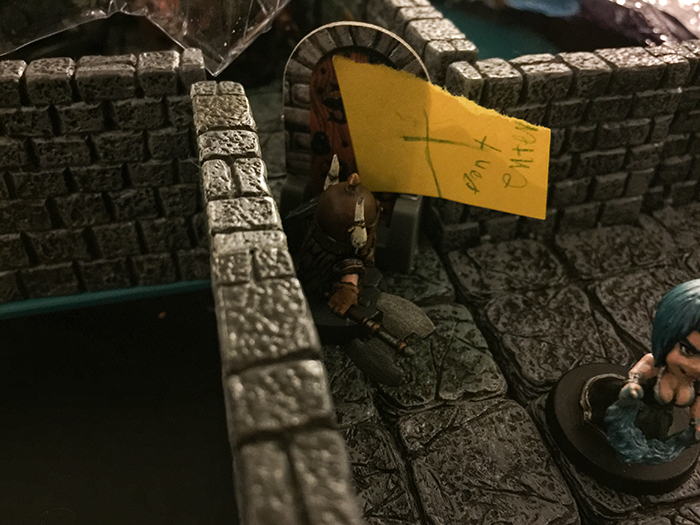 The party opted to leave after looting rex's treasure and thus missed out on the BooBooty. In the end they had enough coin to buy a crossbow, which they gave to the elf. Sadly the wizard will now be 1 quest behind her allies for gaining new abilities. Next time... Quest 2: The Rescue of Princess Ruby. It's nice to see someone who still knows about Hero Quest. I swear...no one has head of it these days, and games like SDE just wouldn't be without it. Or, at least, they would be very different. I haven't been able to look through all the stuff you posted yet. At a glance it looks very through though. I'm impressed. 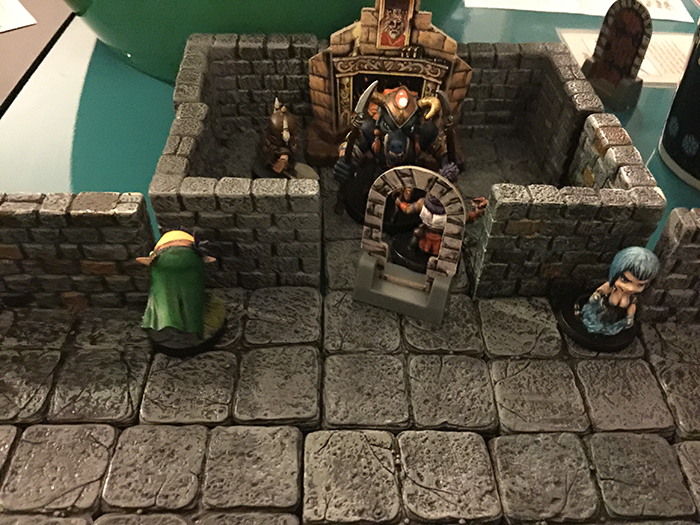 I've only played Heroquest once. It was all right. 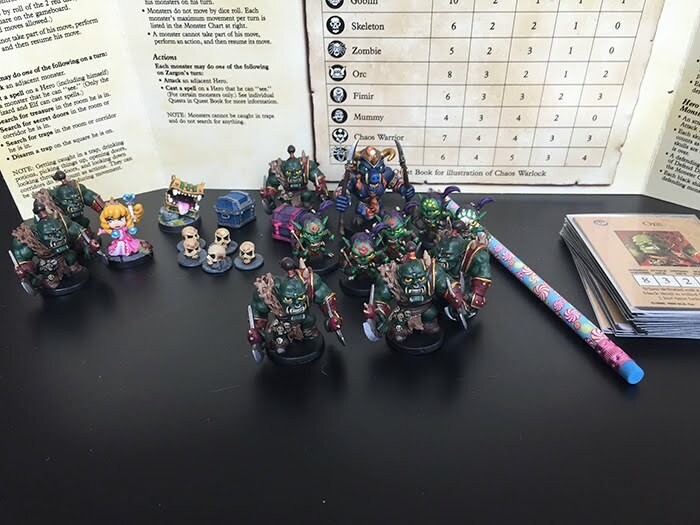 I don't really have much of a gaming group to play with though. If I had one I'm sure it would be better. Awesome work you've done so far though! Upon your safe arrival back in Crystalia Castle the royal guard quickly usher you to a private audience with Princess Sapphire. She eyes you cooly as you enter the antechamber, her demeanor serious and a bit tense. Eyeing you all appraisingly she finally speaks, “You have returned. Good. Your timing could be no better. There is a matter of great importance that must be handled with swift, decisive action, but also… discretion. My youngest and most hot headed sister was captured whilst adventuring. It seems the Arcadian Reavers are responsible for this, and their leader Sting has demanded a ransom be paid for her return. Crystalia will never give in to the demands of terrorists! It is for this reason that I need the four of you to sneak into the heavily guarded dungeons of his fortress and rescue her. Know that no reward or favor will be gained if she is killed in your attempt. ♥ Use the Arcadian Reavers monster set. ♥ When the door to Princess Ruby's cell is opened, in addition to the standard alarm effect, add a door to the edge of the game board. each Consul turn roll a d6. 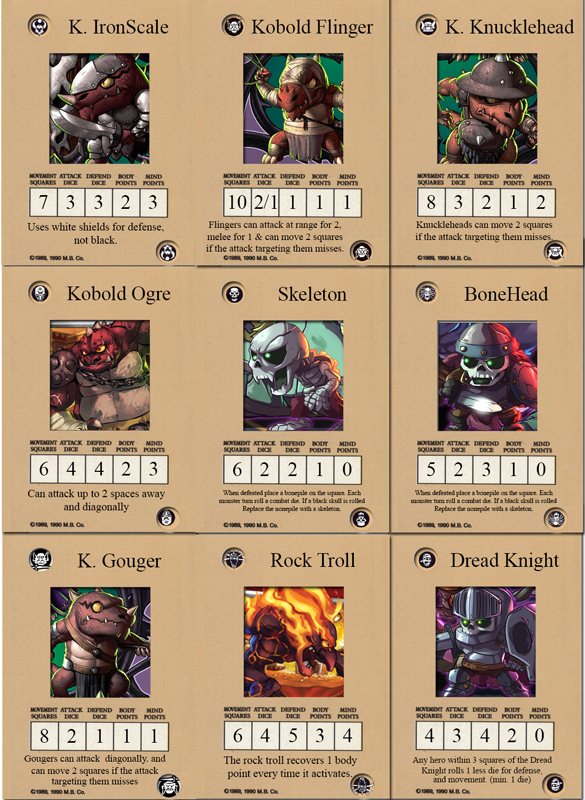 1-3 a goblin appears, 4-5 an orc, and 6 another beastman spearman. They only appear this turn, they do not activate. skip this if the heroes are having a hard time. Because this is light hearted, Ruby does not die when reduced to 0 wounds, but all will remember how poorly the rescue mission went. This one was a lot of fun. The (new) wizard is just as lucky with treasure drops as the last one. The elf continues to be the bad luck kid, constantly finding traps and in this one, the boo booty solo. All the heroes and Princess Ruby survived. Nice! 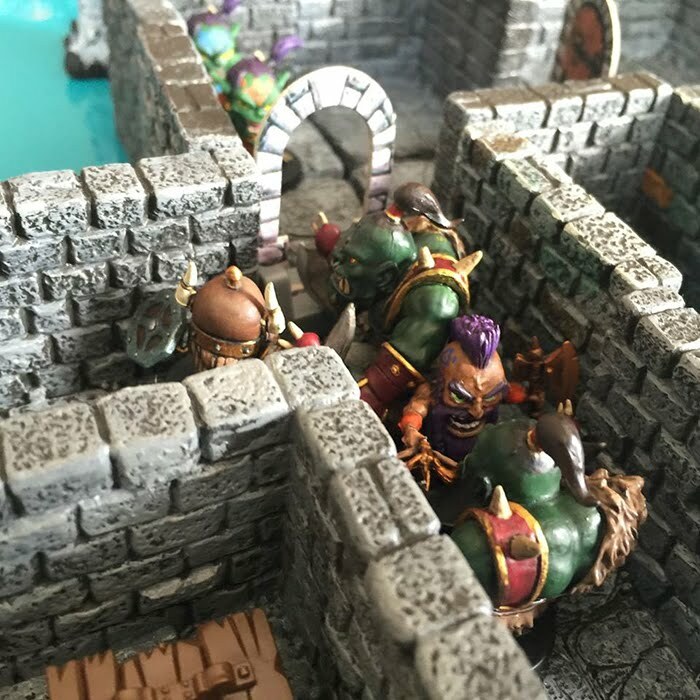 I love HeroQuest! I consider it my "main game". Closely followed by Space Crusade and SDE. Basically it looks like you added a level system to HQ alongside more fleshed out monsters? And of course switched models. It could have been interesting to see a HQ-like system that carried more of the SDE rules. Like using the exploration parts and board from HQ, but abilities, cards and combat from SDE. Ideally, that's what I wanted to do, but unfortunately my kids are not fans of SDE v1 mechanics. I have FK arriving today, and my plan is to slowly add more and more SDE elements into the gameplay, like spawn points for example. 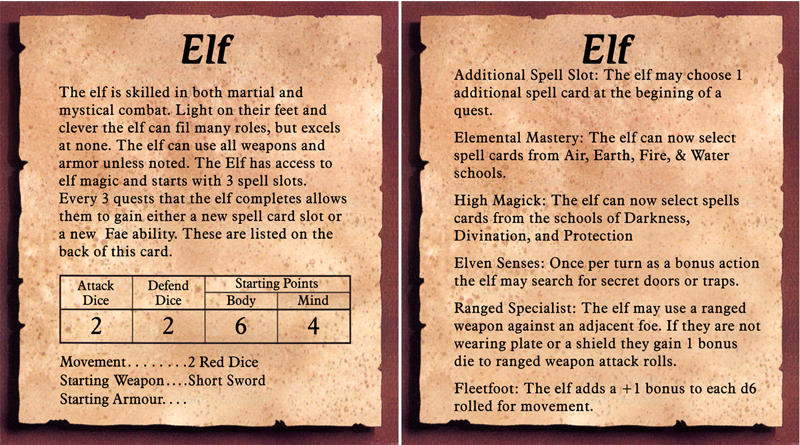 It's also an idea to make "spell cards" that are signature moves/abilities of SDE characters/classes and make them unlockable through "leveling" and adding in some extra treasure deck cards, like boobooties and items based on loot cards from FK or potions based on hero pot abilities. For now I do have bone piles and boo booties which adds a bit of SDE charm to things, we also keep the narration pretty upbeat and silly to honor the theme of SDE. Princess Ruby for example was a bit of a hot head when they were rescuing her and that got lots of laughs and giggles from everyone. Heh! 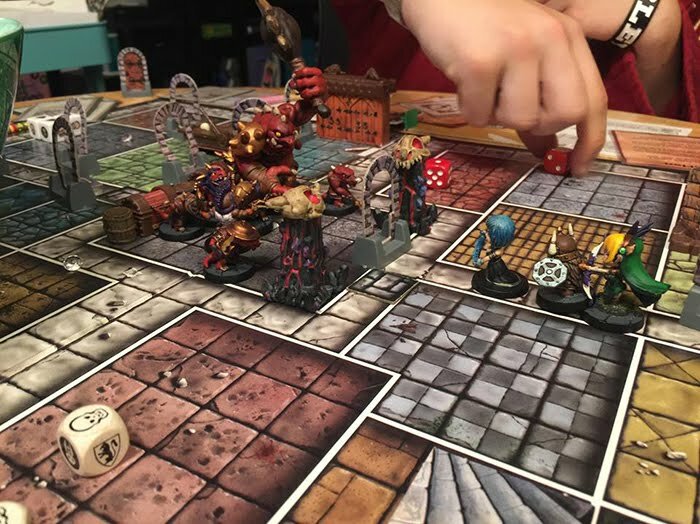 It's hard going against those clean simple combat rules and GOAT combat dice! 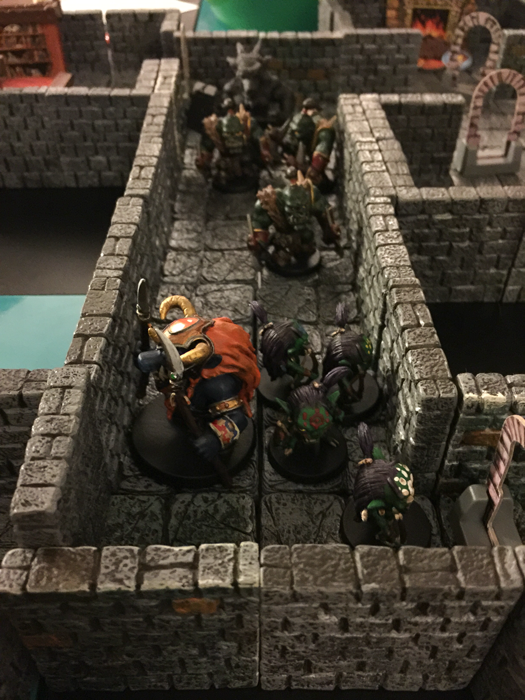 This week the heroes took on the orc warlord Sting in his fortress. Was a pretty tense session, but the players were smart and tactical and won the day using every spell they had to fullest effect. ♥ Designate a cool orc for Sting, give him 3 or 4 body points. 2 is just lame. ♥ if your heroes can handle the challenge have Sting sound the alarm when the fight starts, opening all remaining doors and spawning all remaining monsters. Magic was used to great effect this game. 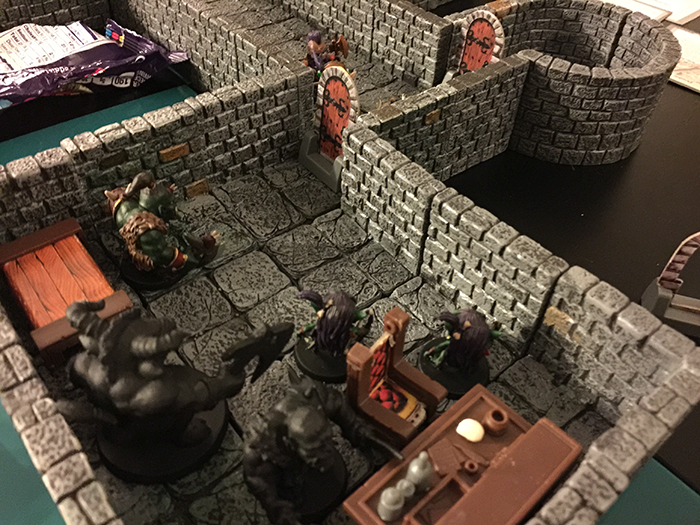 The party wizard had taken wall of stone, and once battle with Sting had been engaged, and the alarms sounded, she used the spell to blockade the boss room. This stalled the reinforcements long enough to dispatch the boss and his crew. 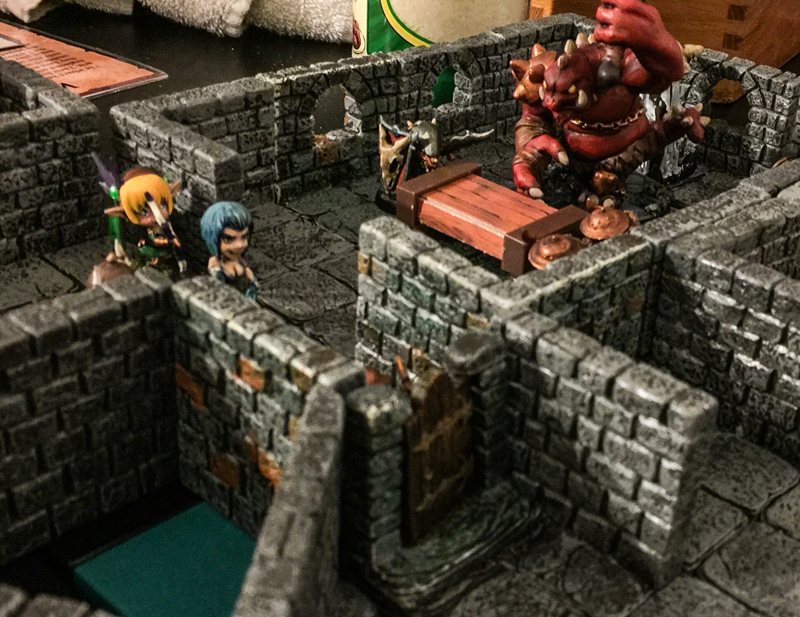 At this point the elf and wizard buffed the Barbarian who took up tanking position in the now destroyed doorway. 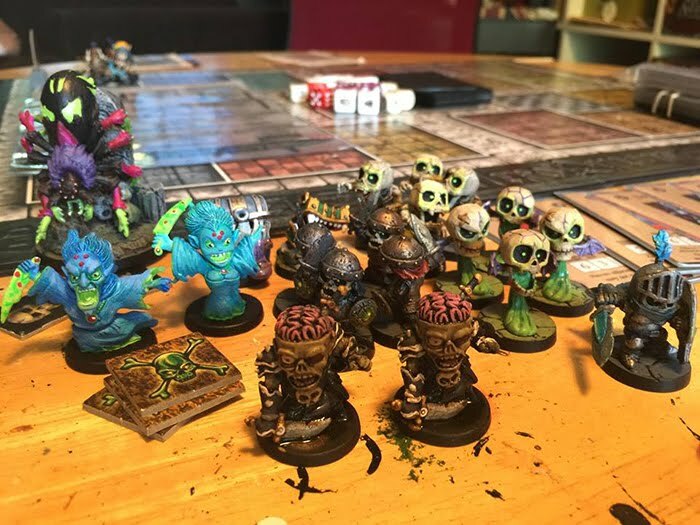 Eventually the monsters were defeated and routed, and the players claimed victory. Having completed their third quest they each chose a level up ability. 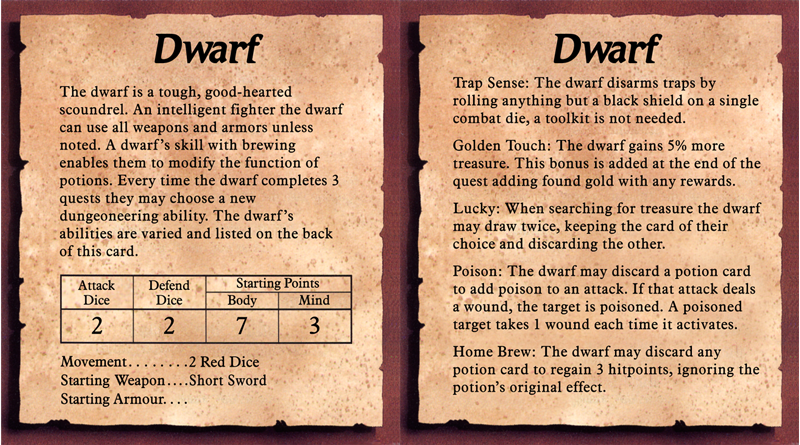 Next week... Kobold bandits have stolen a shipment of dwarven goods!!! 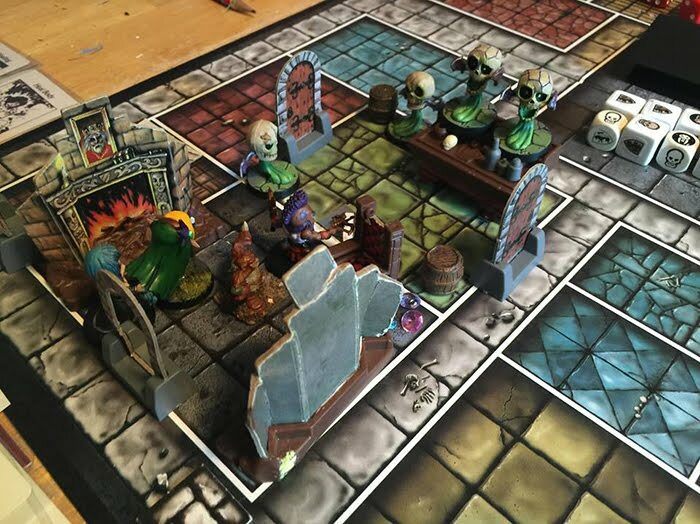 This is inspired work; there are quite a few fan-modded versions of Heroquest out there and most have great ideas, including yours. 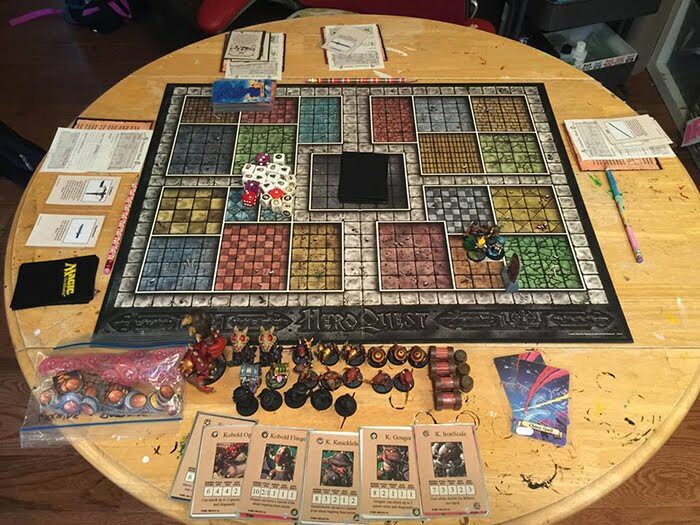 I LOVE HeroQuest, in a nostalgic way; there are very few games that do the 'dungeon master with a map' like HeroQuest did and I really miss it! 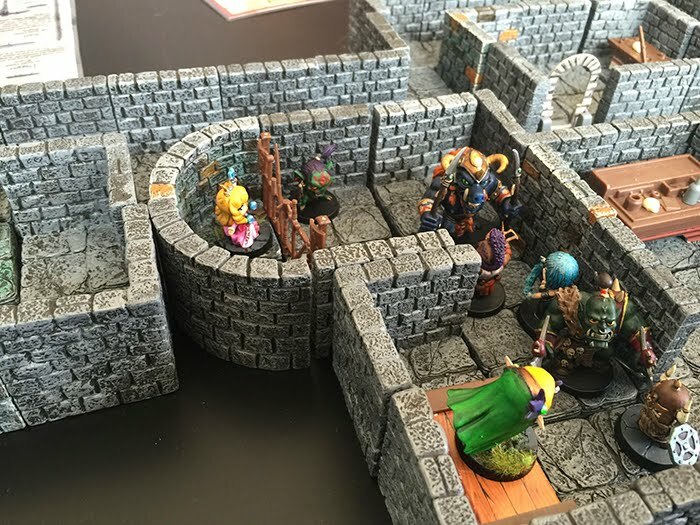 I would like to see the dice changed to SDE dice to evoke the feel of SDE but in a setting they can actually explore... (using Heroquest as a concept, rather than mechanics). Just a thought I had that in no way detracts from what you have done. Excellent. Rep the barrels of lager with chests if you don’t have barrel minis. This is the quest that made me rethink boss monsters. 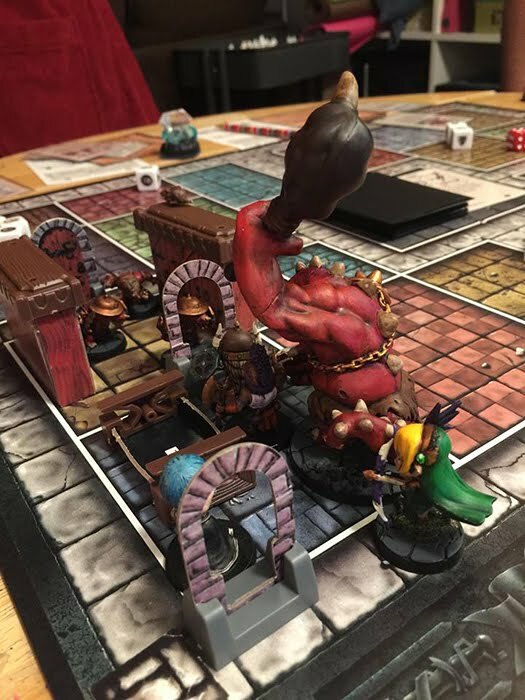 HeroQuest is pretty one sided, and poor gutsack got dogpiled before he even got to act. Was pretty bogus. Might be cool to make spawn points provide damage shield to bosses until destroyed. Busted out the old board. 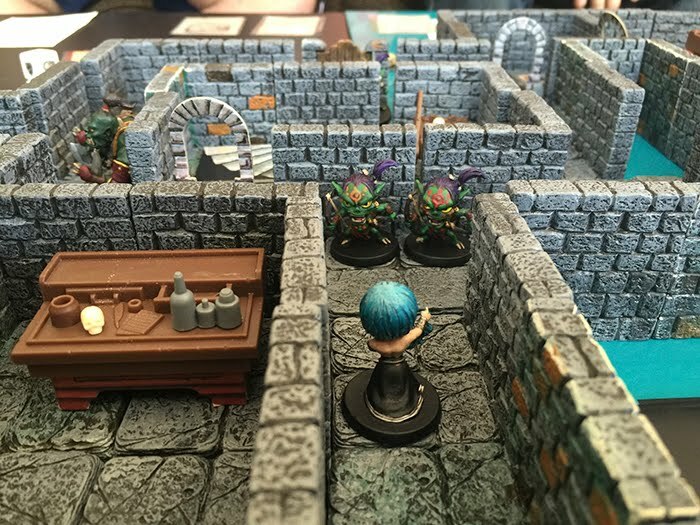 dungeon tiles can be a pain sometimes. 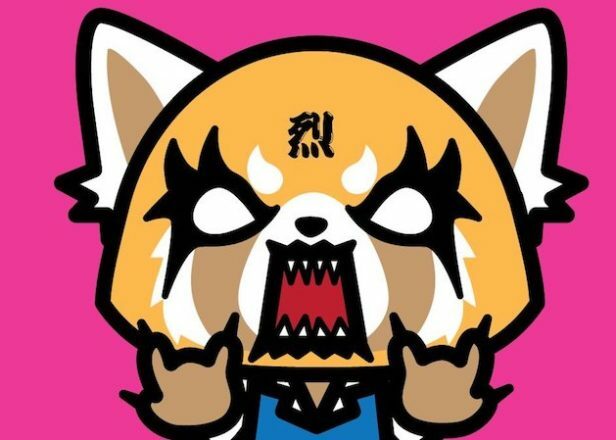 "The wandering monster on this quest is a KOBOLD OGRE?!?! Guess we are done poking around for treasure..."
Gutsack and friends, shortly before getting schooled. Last edited by CrashGem on June 20th, 2015, 10:15 am, edited 1 time in total. Use whichever flavor of undead you prefer, mix and match. Notes. 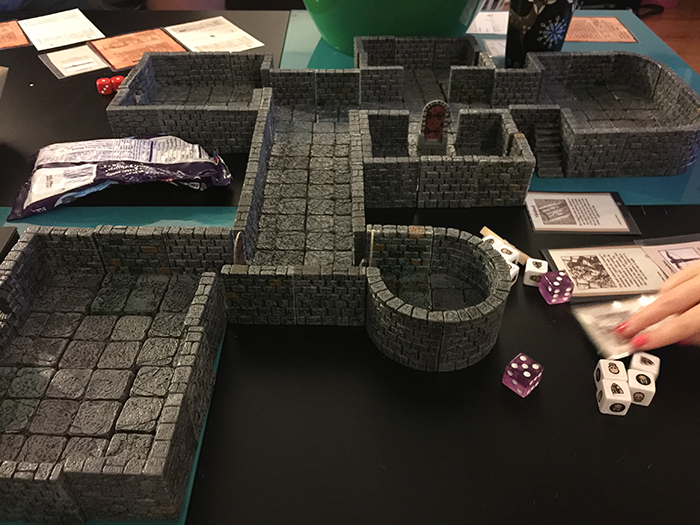 This dungeon killed the barbarian. It was pretty awesome. Ghosts were a lot of fun. The crypt spider must have made an impression, because they nuked it down as soon as they saw it. I went off script and filled this entire room with bonepiles, it made for a very fun encounter. * The art of wait.